Muscle Shoals – The Incredible True Story of a Small Town with a Big Sound comes to the UK. Watch the trailer and see a list of cinemas to find a screening near you. Located alongside the Tennessee River, Muscle Shoals, Alabama is the unlikely breeding ground for some of America's most creative and defiant music. 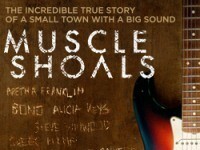 'Muscle Shoals' the Documentary Film is coming to cinemas in the UK. The Muscle Shoals documentary was recently on the David Letterman show and featured a performance by Alabama artists Candi Statton, John Paul White, Jason Isbell and The Swampers. This song is one that is showcased in the film, Muscle Shoals, that is out in the UK now.